Tie-Dye Butterfly Magnet - I Can Teach My Child! Here’s what you’ll need: coffee filters, markers (we used regular AND Do-A-Dot Markers , which worked really well), clothespins, pom-poms, googly eyes, glue (our pom-poms wouldn’t stick to just plain Elmer’s glue, so I had to use Tacky Glue), and magnetic tape . 1. Flatten out your coffee filter (one per butterfly). 2. Let your little ones get started coloring on them using the markers. Little Brother had lots of fun with this part! 3. Spray with water using a spray bottle while on a plate until all areas are wet, but not soaking, and then let dry. Here’s a tip…this is a little TOO wet! 4. Put a line of glue on your clothespin. 5. Add your pom-poms. If they don’t stay on, try using some tacky glue or hot glue. If you don’t have pom-poms, you could just cut out small circle to glue on! Then add the googly eyes. Here are the coffee filters after they’ve dried. The back right is Big Brother’s first attempt (purple blob), the back left is the one made with Do-A-Dot Markers , and the front is Little Brother’s! 6. Gather the coffee filter in the center and “fluff” the wings. 7. Attach the clothespin and then add magnetic tape to the back. All done and ready to “cuteify” your refrigerator (yes, I just made that word up). What’s your favorite butterfly craft??? PS- I know there are a million butterfly/clothespin crafts out there…the specific inspiration for the tie-dye came from a second-grade teacher I used to teach with! Very creative! I like this project! Found your site over the weekend and love the simple, hands-on learning activities! We will be using this craft idea at our daughter's art party in a few weeks! Thanks so much! We did butterflies and I also had my first graders make rainbow fish and then we would attach a shiny scale with tin foil. Just now I thought of a cute idea for party favors too. 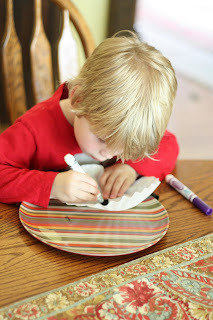 You could use the coffee filter and have your child color it and make it tye-dye. Then make a little pouch with a treat inside (M&M's or a small toy) and tie it with ribbon at the top. Then they would have a handmade favor to hand out. I like using butterflies for a symmetry lesson. Cut out a paper butterfly and then paint blobs on one side of the butterfly and fold it to see how the paint is the exact same pattern on the other side. We made these recently too, though I didn't think to make them into magnets. Definitely need to remember that for next time! Thanks! I wish I had children so I could make these without shame. Made these today! I added antenna. They turned out very very cute! !